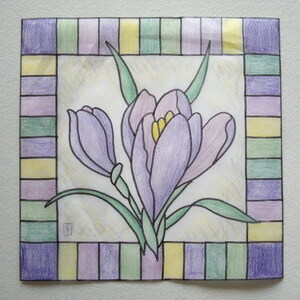 1 - This is my sketch design of how the finished mosaic artwork should look. 2 - The Pro-Panel block board, that will form the base of the mosaic artwork, is sealed with two coats of diluted Weldbond glue. 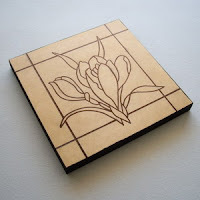 3 - The outline design is transferred onto the board, using carbon paper, and then the edges and the back are given several coats of black acrylic paint. 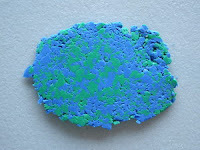 4 - Custom colour blends are created, from the blocks of polymer clay, for the different elements of the design. I roll out thin sheets (2mm thick) of the different colours, using a pasta machine to ensure they are an even thickness. 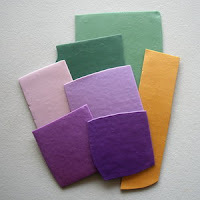 The sheets are then baked to harden the clay. 5 - Each piece of the design is cut from the baked coloured sheets of polymer clay. 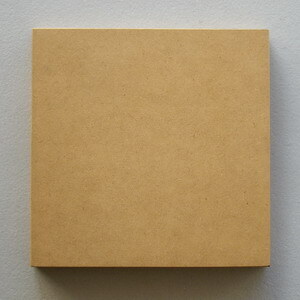 The edges are sanded smooth and the back is roughened with coarse grade sandpaper, to help create a ‘key’ for gluing. 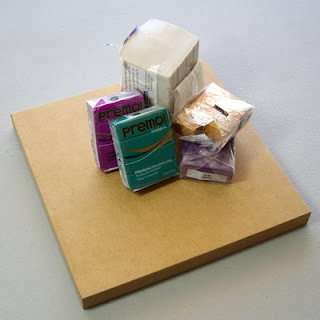 6 - All the pieces are glued in place, using Weldbond glue, and left to dry for at least 24 hours. Minor trimming of some edges may be necessary to ensure neat, even joint lines. 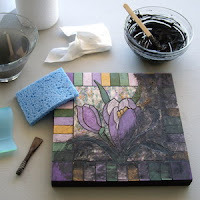 7 - Acrylic paint is used to colour the tile grout, which is spread over the artwork, pressing it into the joints. The excess grout is wiped off with a damp sponge before it begins to cure. This process may need to be repeated to ensure all the joints are evenly filled. 8 - After the grout has dried for at least 24 hours, the tile surface is lightly sanded (with grades 400 through to 1000) to remove any remaining grout residue. 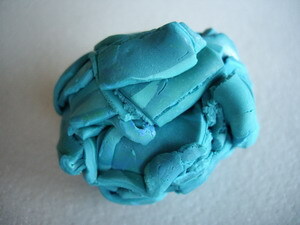 It is then hand buffed to give a soft sheen. 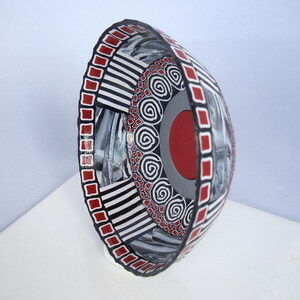 Here are two bowls I have made from polymer clay. 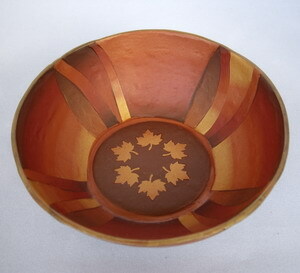 I used a small glass bowl as a form and pressed thin pieces of clay to cover the outside. After baking, I carefully prised the moulded clay from the glass. And here is the scrap! I thought I would use up some old Kato clay (I bought it a while ago to try but personally do not like the strong smell it has) but it turned out to be a disaster. I am only posting these photos because I want something to show for having wasted a good part of the day trying to condition this old clay. In the end I gave up and threw it in the bin! I receieved the disappointing news today that the sale of my mosaic artwork, 'Our Future', has fallen through. The purchaser had problems with their credit card on the opening night of the exhibition and despite assuring that they were going ahead with the purchase, they have failed to pay. Perhaps I should not have been so hasty to post the sale on my blog - but I was told it had been sold. Today it was take down day for the NZ Art Guild Annual Members Exhibition. I was thrilled to learn that my mosaic artwork 'Our Future', created specifically for this exhibition, sold on the opening night. 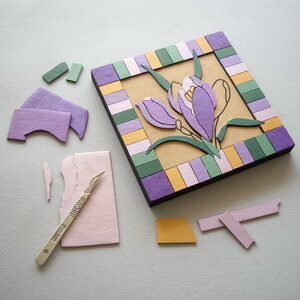 I am currently working on my next polymer clay mosaic artwork. Here is the sketch design. 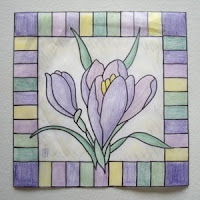 I have used this crocus design before, many years ago when I was doing glass painting, but it will fine for this next exercise. I have decided to take step by step photos, to document the different stages in the creation of this artwork, which I will post when it is complete. 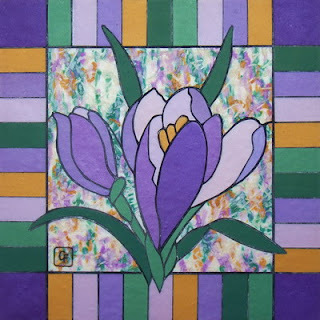 It will be useful to have on display, when I am selling my work, so people can understand how my polymer clay mosaic artworks have been made. The above link will take you to ClaireFairweather's Shop on Etsy.com.